Johnny Casino releases his new record, Trade Winds and ramps up the atmospheric menace in his crashing rock n roll while retaining the hooks that his fans have come to love. Something seems to have run through the veins of Johnny Casino since his previous outing as the powerpop-infused rock ‘n’ roll that he has purveyed over the last few years has been replaced by something altogether more urgent, and perhaps lurking with intent. Opening song Ghosts In Your Mind is a brooding lament that crashes along, breaking down mid-way through to almost fall apart before once again gloriously rising up out of its own ashes. It’s a definite stamp of his air of confidence to open his new record in this way; dispelling previous conceptions and setting out on a new road. Well, so it may have seemed until You Can’t Give It Away flies in to remind us that all is well and to be expected. It’s a fantastic slab of swirling rock ‘n’ roll, the hooks propped up by glorious harmonies and organ. It is also home to one of his best lyrics of late. “Drink from the well while you piss in the river.” A perfect summary of the world as it stands. Elsewhere title track, The Trade Winds, lounges along on tremolo-drenched guitars and reverb-soaked vocals, almost coming out as R.E.M. covering Velvet Underground and instrumental Pajaros del Mar drops the pace even further. It’s the sound of the ocean lapping gently at the shore as the sun comes up after a long night, and the title a beautiful ode to his adopted country of Spain. It’s the perfect interlude before he picks up the pace once again on the soulful rocking Oh Night, dropping in the wonderful guitar licks and rhythms that he’s become known and loved for. Temptation sees him doing his best rallying Springsteen and just when you think he’s going to keep the rhythms riding hard past the finish line Anytime slows things right down again with its organ-led slow dance vibe. Finally, Somewhere Lost In Time closes off this eight-track album fantastically, a rousing rocker that brings the album full circle. 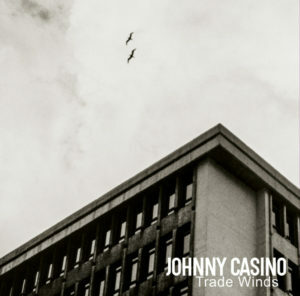 On Trade Winds Johnny Casino has mixed his ideas more than on previous outings, and the result is a rounded collection that takes the listener on an aural journey from start to finish. The songs may not be as instant as they were on Casino’s 2013 sprawling double album Keep On Keeping On, but with every listen they certainly grow and fuel his fire, adding another great album to his canon.